Gunite is dry sand and cement mixed and conveyed pneumatically to a shooting nozzle. Water is added as the mixture is shot directly on the point of application. The resultant concrete has a high cement-to-water ratio and high compaction, making it stronger than most other forms of concrete. Gunite and Shotcrete are two trade names that refer to the technical terms; ‘Dry Shotcrete’ and ‘Wet Shotcrete’ respectively. Both are methods of of spraying concrete, but the two techniques use significantly different processes to accomplish the same goal, and as such have different rates of success. In brief: The Gunite method keeps the concrete components separated until the moment of application. 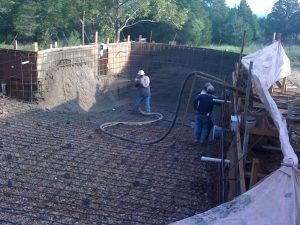 This eliminates many of the problems that plague Wet Shotcrete, and is ideal for complex jobs like a well designed swimming pool, important structures for which structural failure is not an option, and structures that are expected to last more than a few months. Because there is no ‘ticking clock’ for the gunite method, gunite affords concrete workmen the time they need to do their jobs properly instead of racing against the setting of Wet Shotcrete or fighting against the practical logistics of performing a job in the real world. 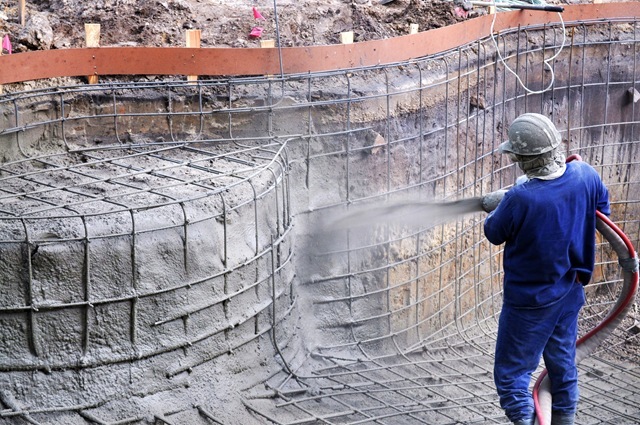 Wet Shotcrete (or just ‘Shotcrete’) can be applied faster and is generally acceptable for small, simple, uncomplicated jobs where the cost and consequences for failure are low and the structure is not expected to remain structurally sound for more than a few months. It’s successful application relies on a worryingly large number of things ‘going right’, but under ideal conditions a structure shot with Wet Shotcrete can sometimes approach the quality, integrity, and endurance of a Gunite structure. Our extensive experience in the Gunite industry and with Gunite contractors of all kinds makes us familiar with businesses of all sizes. Strong can be your single source for complete Gunite systems and can anticipate your needs with a brief consultation.